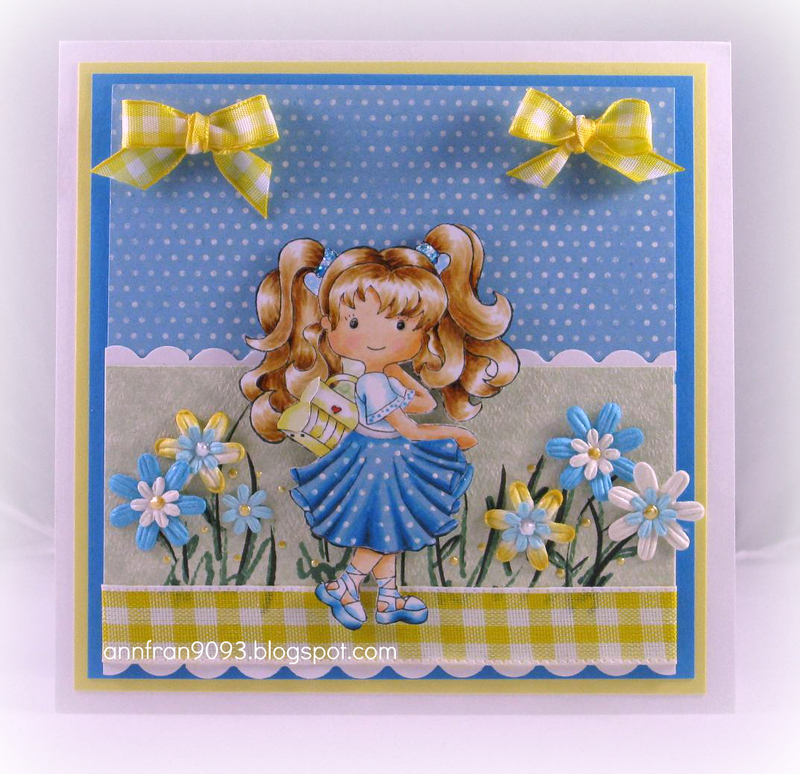 Vivi here with a card for the ribbon and sparkle challenge! and I wanted to color her hair different than brown.. so I picked the BV family.. Here a close up on the flowers so you can see the sparkle!! I added a little bit on the brads too.. but, unfortunately, it cant be see when we take picture! 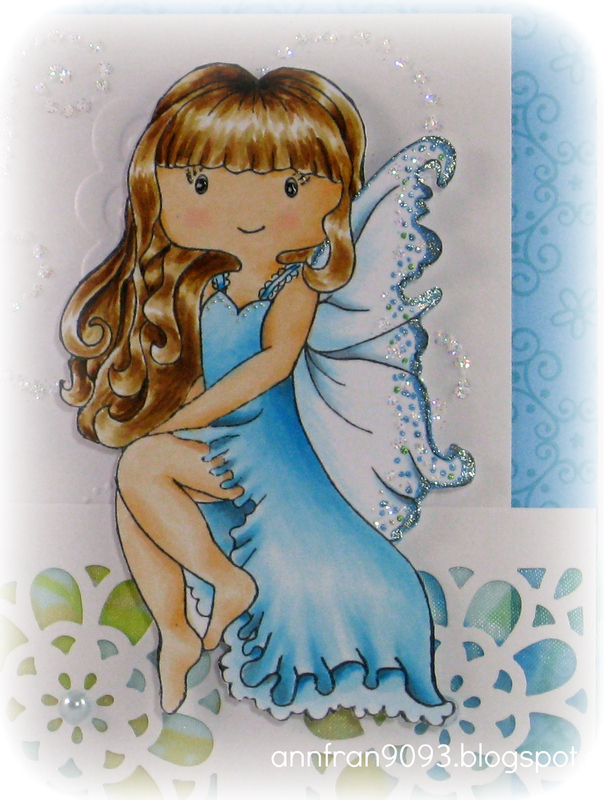 I hope you liked my card and come on over to play with us! Hi ~ Keep those glittering cards coming! I inked up Gilli Fairy 2 for this challenge. My multi-colored ribbon is hiding a little bit, but I thought it looked pretty under my MS die cut flowers. I added Glamour Dust glitter to the edge of Gilli's wings and the swirls of the paper. The butterflies received a coating of Crystal Stickles. Hello hello friends! anaRy here. It has been a little while since I posted over the house….good things have been cooking and I promise to be here more often soon : ). Today I will share a little projected I created using “ Start set” from Gilli Rubber stamps. I never though a start stamp would give me such much! But a star says a lot….and today I say you are all start to me and the DT!!! Thank you so much for entering your lovely projects in out challenges! If you would like to see more of my work..you can hop over to my blog…the door is always open over there too! Jo here to host another fabulous challenge here at The House of Gilli. We challenge you to show us what you have with Ribbon and Sparkles on it. If you have a Gilli we would love to see it, if not no worries we love seeing your projects. Today I have for you Gilli as a cowgirl. Is’t she just adorable. She is all deck out in her cowgirl outfit for a night of dancing. Gilli is colored with my copic markers and little extra shading is done with colored pencils. Gilli’s shirt is covered with sparkle aka stickles. My paper is from K and Company Sweet Nectar. I matched the copic colors to the paper. I would not have thought about using yellow with the pink but I really like the way it looks together. My die cut is a new one that I just got from Cherry Lynn. My ribbon is some that I picked up from AC Moore on clearance. It is much prettier in person. I added a few pearls around just for a little extra. I hope you will join us for our challenge. Be sure and put your entry in the INLINKZ at the bottom of the page. Thanks for stopping by today and checking out House Of Gilli. for the Flowers Challenge here at the House of GILLI ! one of my favorite stamps ! Here's the card and hope you all participate on this challenge. 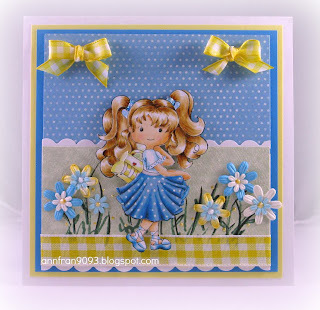 Time for another Gilli stamps challenge and this one is an easy one for me..Flowers. I tend to use flowers on most of my cards and I own large buckets upon buckets of paper flowers that are just begging to be used. This is my first attempt outside of my standard colour combinations and while it still needs more work and practice I think it turned out okay. I really enjoyed breaking my routine and thinking of all my friends of different ethnic backgrounds and how much nicer it would be to give them a card with a girl coloured more to match their own skin tones. I am going to keep practicing and have fun trying new colour combos! 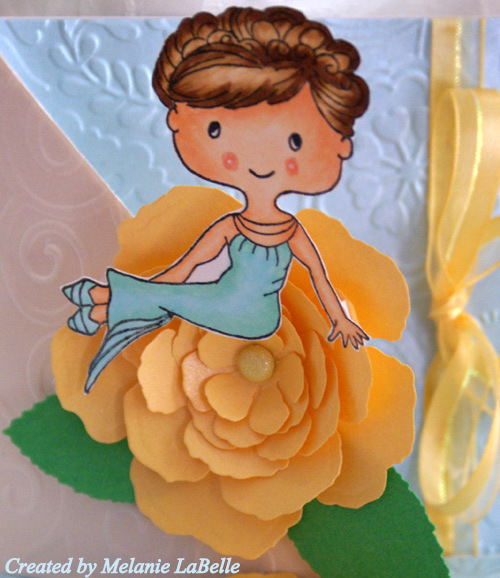 To highlight my sassy Lady Gilli I added a big flower to set a festive air to the card. I then matched my papers to her dress and shoes and of course added some sparkle too. Lady Gilli always needs to sparkle! hee hee. I hope you play along with us over at House of Gilli and add flowers to your creations too! Vivi here and I bring a card to show you for the flowers challenge! I made a clean and simple card this time and used acessories stamps as main image. copic markers: V25, V22, V2-, Y38, Y15, Y04, RV19, RV17, RV14, BG19, BG16, BG13, BV04, BV02, BV00, YG67, YG63, YG11. stash: wooden flower button, double sided ribbon, rhinestones. So, hope you could get inspired with with my card and you come over to join us! Jo here today for our challenge hosted by Mel. The theme is flowers. So break out those stamps and accessories and show us some beautiful flowers. My card today is using Gilli Florist. I have paper pieced her shirt that has little flowers on it. The rest of the image is colored with my copics. The papers I have used are from the Imaginisce Garden Party collection. 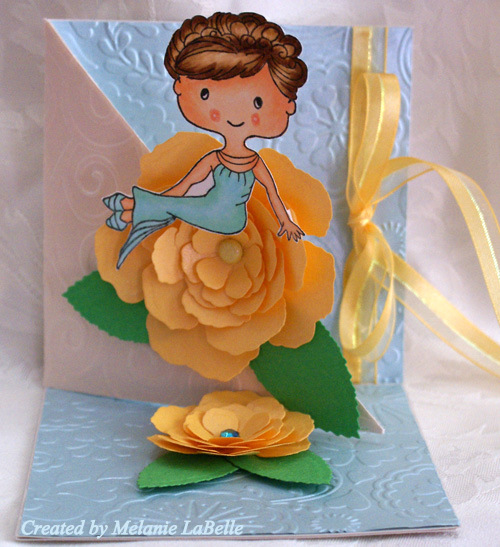 The flowers were created using Lifestyles die cut that a good friend gave me. A little white seam binding for the bow and some pearls. Doesn’t Gilli look like she is stepping up to the counter to help you pick out that special flower arrangement? I hope you will join us for the challenge here. If you have a Gilli stamp we would love to see it, if not no worries we love seeing what you come up with using our theme of flowers. Be sure and add you entry to the inlinkz to be eligible. Hi! I just had a look at the Gilli entries and they are so gorgeous! Keep those flower cards and projects coming! I loooove Springtime and the flower theme is perfect. I made a card using the adorable Stroll Gilli. I colored her with Copics, and paper pieced and shaded her skirt. Happy Monday everyone. Today we are starting a brand new challenge here at House of Gilli: Flowers. I would like to thank everyone for all the beautiful entries for the White with one Color challenge. I saw this easel card and thought it would be fun to try to create with Sitting Bride Gilli, who I naturally colored with Copics :) For my flowers I used the Spellbinders Die, Rose Creations, I just love these dies. My papers are embossed using Cuttlebug Embossing folders: D'vine Swirl and Floral Fantasy. This challenge will end on March 22nd, so we hope you will stop by and join in :) Cannot wait to see what you all create. a wonderful and blessed Easter ! White + 1 Color Challenge hosted by Mel. and White + Yellow ! on this card here at my BLOG ! 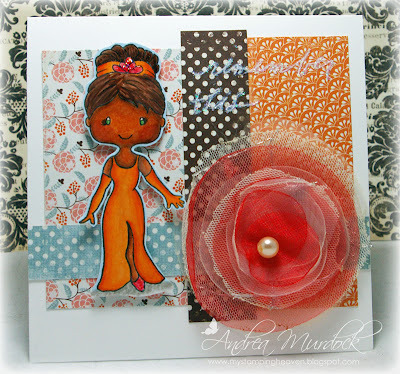 I'm back again today with a card featuring Lady Gilli for the current challenge at the House of Gilli blog! Our current challenge is to use white and only one other colour on your card. Thankfully we are also allowed to use our skin and hair colours as usual but other than that it must be white and one colour- in my case pink! I actually coloured Lady Gilli in fully but I wasn't fond of how I coloured the pleats in her dress. I really liked everything else though and I was bummed at the thought of throwing it out and starting over. After a few minutes of sulking (hee hee) I got the idea to just frame her face and make her into a portrait. I think it turned out great and I got to keep the part of the image I really liked my colouring on. Keep that in mind next time you make a booboo on your card too. Maybe you can salvage part of the image like I did today and take your card into a whole other direction. 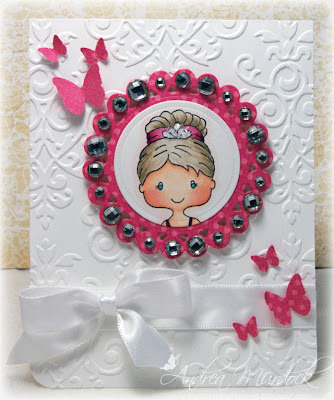 I then wanted the card base to really stand out so I used a Baroque embossing folder to make my white card base pop! I added a frame behind Lady Gilli and decorated it with crystals as I would imagine a ritzy frame would look like on her dresser lol. Some butterflies and a bow finished it off. Voila! So come and play along with us at H.O.G. Scroll down below this post and you can also see more lovely inspiration from my fellow DT members. stash: ribbon, customized pin and rhinestones. I hope you like my card, got inspired by it and come on over to play with us.